Just brain storming, can there be some microscopic differences on the surfaces of the disks due to machining process (clockwise /counterclockwise rotation etc.) during the manufacturing? John, if you were to lay the two atop each other as if you were putting them both on the same side you'd see the difference in the pattern of vent holes. That said I doubt that you'd notice a difference in braking if you were to swap the rotors to the incorrect sides. OnaWingAndaPrayer and John J like this. Very good point Ken, the holes do not line up when done that way. Your comments have changed my mind in that I now think the hole pattern (diagonal lines of 3 then 2 holes) is to get water etc directed to the outside of the rotor so, for me personally, I will use the correct one on each side. I accept though what you say in that you would probably not notice a difference when braking. I REALLY doubt a difference would be noticed because the water will easily disperse regardless of the hole-line direction. The pads only cover a small part of the rotor, most pads also have a channel cut in them, so there should be no ill effects. But I can be a little OCD on some stuff and agree in in reference to correct direction preference. Ar you saying Euro spec 1500 front rotors do not have a grove set cut into the sides of them? They are flat faced? They meant for the rear pedal to be primary, while right front is supposedly used for additional stopping and final low speed to stop. Why was the OE rear brake pad so thick-long wearing?! Probably same theory- expecting rear weight and stopping needs based on inter-link system. Show of hands- if you use the front-right as your main/only stopping power? 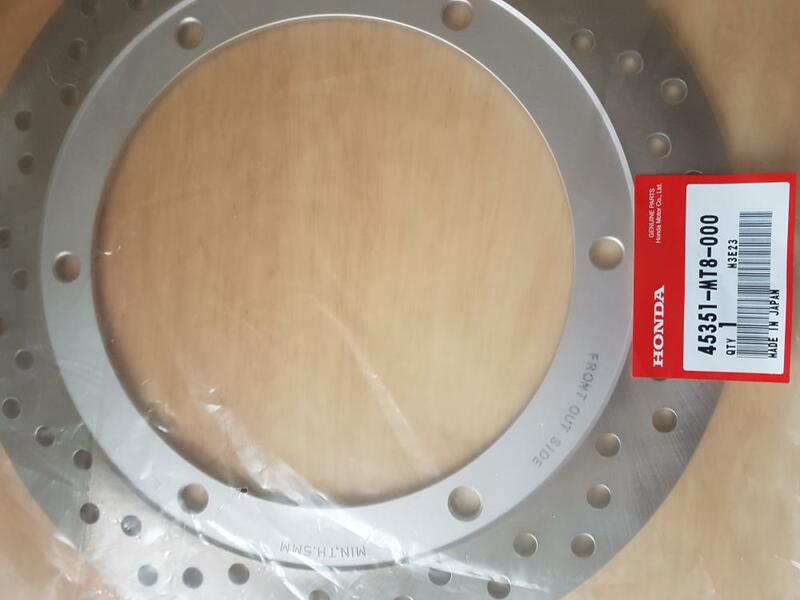 Another brainstorming, Honda engineers may have preferred using different part numbers although they are exactly the same rotors, thinking in case of any possible failure in the future, it would be easier to handle the issue. I noted the extra wear on our '97 while the wheel was off to mount a new tire, I measured both, found the left worn most but still within spec, and .... and so I swapped left to right and installed new pads. I used a dial indicator to check run out when reinstalled and they were as perfect as they could be. I did a few bedding in stops, they are fine. One side wears more because it gets used more as always with rear brake. Only difference left to right is direction of hole pattern and the "L" and "R" stamp. No one sees either under the covers on the GL1500. My '85 GL1200 likewise has a L & a R and again, it's the sweep of the holes pattern that differs. OK, to throw another thought or two in here I would say this. You mentioned that it was approaching the minimum. I'm sure for liability Honda is very conservative when they list the minimums to make it idiot proof. You know the guy who runs the bike another 1000 miles after the brakes are metal on metal. So, if it were me I would use the original again. Just be mindful of it and when you start to get toward the end of the pad life do a brake job again. The biggest worry is that the rotor would be so thin and some yokel wears the pads so low the caliper pistons pop out of the calipers and no brakes! It is not at the minimum so one more use at least will be no issue. At the minimum use it once more. It's your decision but I will say this. If it were my bike I would put the original back on. At the end of the next pad change you might well see it still has not reached the minimum. Both of my rotors are just below the minimum and I just never let the pads wear past 3/4. For me it works out that I change brakes each time I change tires. Show of hands.... I tend to use only the right-hand lever when slow moving in town and both left and right brakes at speed. I'm probably too heavy on the right side in general though. I use them both on both the 1200 and the 1500 ...... but especially the 1500 as it's a heavier Trike with those generous 9" drums out back whoa-ing those two 215/70-15 tires on 17x7 wheels.